Life as a hospice caregiver is an honor and a blessing, but it can also be stressful. 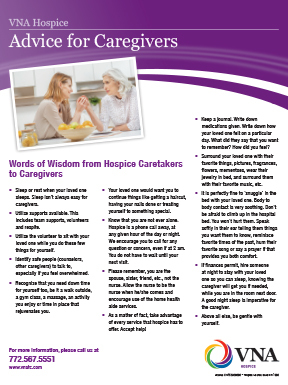 It’s not always anticipated or easy to take on the role of caregiver. There is much to consider. Reviewing legal documents, paying bills, transportation for errands, medication management and emotional support are some of the tasks you might take on. Hospice can help. Hospice is here to be a pillar of support for both the patient and the family caregivers. It’s impossible to fully prepare being a caregiver for a loved one at end-of-life. It’s difficult to know what to anticipate. However, here are a few tips to help you in your role. Educate yourself. If your loved one is early in their diagnosis, take the time know to educate yourself on it so you can anticipate what to expect. With hospice, educate yourself on all the resources hospice has to offer. It’s important to find what helps you as well as your loved one. Respite care. Take time for yourself. Caregivers often feel overwhelmed at times. Understand the importance of building in self-care. Volunteers are available to stay with your loved one while you take some time for yourself. Counseling and support. A team of highly-trained bereavement counselors, social workers and chaplains are available to patients, families and friends to offer grief support, adolescent counseling, one-on-one counseling or spiritual guidance through this difficult time. Use these services if you need them. A dedicated care team. A team of nurses, aides, social workers and counselors are available to help you. Don’t be afraid to ask questions. Understanding what is important to your loved one at end-of-life will help you in your role as a caregiver. Take the time to discuss your loved one’s advance care planning to avoid unnecessary anxiety in the future. Completing a living will allows you to fully understand what matters most to them at end-of-life. If you would like to receive more information on VNA’s Hospice services, click here or call us at 772-494-6161.